Robert Hugh Benson was an Anglican pastor who converted to Catholicism and was received into the Church in 1903. 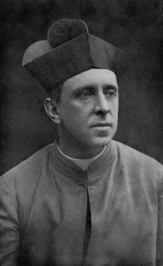 He was ordained priest in 1904. Youngest son of Edward White Benson (Archbishop of Canterbury) and his wife, Mary, and younger brother of Edward Frederic Benson, he was lauded in his own day as one of the leading figures in English literature, having written the notable book Lord of the World. Lie still, and take thine ease. A tender Lord is He. And each is all for thee. All sweet to scent and sight. ― Robert Hugh Benson, Come Rack! Come Rope! What hast thou learnt today? This only have I learnt, that God is love. What hast thou heard today? This have I heard, His voice within my soul. What hast thou felt today? Which short story would you like to read in January? Please only vote if you plan on participating should your choice win.